Melvin Calvin was born on April 8, 1911 in St. Paul, Minnesota. His parents were Jewish immigrants, his father from Tsarist Lithuania and his mother from Tsarist Georgia. They ran a grocery store in Detroit, Michigan at which Calvin helped out when on break from school. His interest in chemistry was sparked by thinking about how the products that were sold in his parent's store worked. He attended Central High School in Detroit and then studied chemistry at the Michigan College of Mining and Technology where he earned the school's first chemistry bachelors in 1931. He earned his Ph. D. in chemistry in 1935 from the University of Minnesota, completing a thesis on the electron affinity of halogens. Halogens (including fluorine, chlorine, bromine and iodine) are period 17 on the periodic table of elements and have high electron affinities because they have seven electrons in their outer orbitals. After finishing his Ph.D. he did a postdoc at the University of Manchester in the lab of Michael Polanyi where he studied phthalocyanines, cyclic organic compounds that form complexes with other atoms and are used as dyes. After two years in Manchester he was offered a lecturer position at the University of California at Berkeley, in 1937, where he was the first non-Berkeley graduate to join the chemistry department in more than a quarter century. Working with Gilbert Lewis he studied the chemistry of the porphyrin the organic nitrogen ring compound found in the heme portion of the hemoglobin molecule. Poryphyrin rings complex with metallic atoms, iron in the case of hemoglobin. Calvin remained at U.C. Berkeley for the rest of his career, where he served as the founding director of the Laboratory of Chemical Biodynamics and as an associate director of the Berkeley Radiation Laboratory. He was promoted to professor of chemistry in 1947. Calvin is most famous for using radioactive carbon to study the chemical reaction of the carbon fixation, the dark reaction of photosynthesis. In plants the enzyme ribulose-1,5-biphosphate oxygense (RuBisCO) adds carbon dioxide to the five carbon sugar ribulose-1,5-biphosphate, which breaks down into two three carbon phosphogycerate molecules. Carbon fixation is what distinguishes autotrophic plants the other heterotrophic kingdoms of organisms. The cyclic pathway by which carbon dioxide is incorporated by plants is called the Calvin cycle. 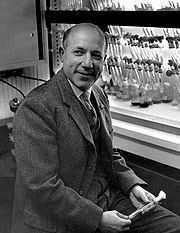 For his research on carbon assimilation by plants he was awarded the Nobel Prize in chemistry in 1961. His other honors include election to the National Academy of Science and a postage stamp honoring him in 2008. He served as president of both the American Chemical Society and the American Society of Plant Physiology. He also served as the president of the Pacific Division of the American Society for the Advancement of Science. He served as an adviser to the National Aeronautics and Space Administration regarding the transmission and encounter of pathogens and organic compounds on the Moon and the planets of our solar system. He also served as a presidential scientific adviser. He retired from Berkeley in 1980 but remained doing research until 1996. He died of a heart attack on January 8, 1997.